I'd forgotten how much I love this series! 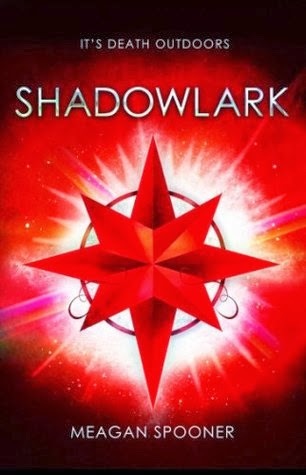 Shadowlark by Meagan Spooner is the second book in the Skylark fantasy dystopian series and I love how surprising it's been. I've really taken to these characters, their relationships with each other and definitely the world-building around them. If you haven't yet read Skylark, you might not want to read further as there will be spoilers for Skylark ahead but not for Shadowlark! It had been awhile since I'd read Skylark, so while some things remained fresh in my mind (mostly this wonderful and tension-filled relationship between Lark and Oren! ), when I first started Shadowlark, I was a little bit hazy about certain details and in particular over the character of Tansy. Some helpful (but not at all over-the-top or info-dumping) recapping early on really helped and I very quickly found my feet with this fun and strong second book in a series. Shadowlark begins not long after the end of Skylark with Lark and Tansy and Nix out in the wild searching for Lark's brother, Basil, after some information that Lark had received at the Iron Wood. They might have just escaped trouble in the Iron Wood but they've just walked into yet more as they find themselves imprisoned in an underground city that is run by a tyrant called Prometheus. The thing that I think I love the most about this book, aside from the surprising twists and turns, is how much the characters deal with their own darkness. Both Lark and Oren as well as a newer character we are introduced to in this book really struggle with who they are, their own abilities and the things they have done. Because this story is told from the perspective of Lark we can feel more clearly how guilty she feels and how much her magical stealing ability weighs heavily on her. It very closely mirrors Oren's guilt with the terrible acts he has committed when he is an Empty One. And it is for this very reason, the fact that both Lark and Oren struggle so much with their own morality, that makes their relationship so fascinating to witness. I love that the attraction is so palpable between them and yet their own revulsion for themselves keeps them apart. And while, for me, Lark and Oren's relationship is a huge draw for me to continue reading this series, I also really love learning more about magic and the other world-building aspects of this story. There was a lot in Shadowlark about magic control and the extent of Renewables magic and I found it all to be very interesting.